The Gay Gamer: Great Dreamcast or greatest Dreamcast? Great Dreamcast or greatest Dreamcast? I'm going with the former option, personally, although I wouldn't fault anyone who goes with the latter. At any rate, the Shenmue-themed Dreamcast console seen in the photo below was produced by the one and only OSKUNK, of course. A few more photos of this beauty can be seen on OSKUNK's blog, Custom Art, so I highly recommend checking it out if you're a fan of Sega's open-world adventure title (and, really, who isn't?). This makes me wish I knew anything at all about Shenmue. Do you have a Dreamcast, Justin? I'm guessing not, but I can't remember. Anyway, Shenmue's definitely an interesting game. One of the first open-world adventure games, basically. Some folks love it, some hate it. I can't say I'm in either of those camps, although that's mainly because I haven't spent much time with the game myself. 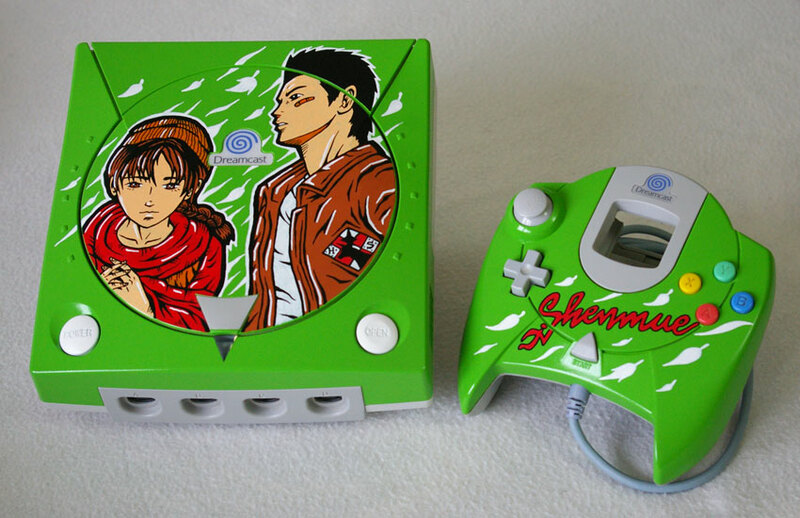 I've always been intrigued by it, though, which is why I perked up when I saw this custom-painted Dreamcast.